There are a whole bunch of things that are wonderful about this -- one of them is that I love to be behind the scenes, back stage -- I love the special place where you can see how the magic is made -- the things that most other people don't get to see -- to see the swords up close, to see the set closer than other people get to see it -- to be able to pass that weird boundary where you see how things are made -- the safety pins, the makeup -- that stuff. Another magical thing about it is walking in the door and the actors seeing me and waving and acting excited that I'm there. I love feeling like I'm an important, if small, part of the thing that makes things wonderful. I arrived during Fight Call, which is the time before the play where the actors go over ever single combat scene, one right after another, it's the action movie version of the play -- they do this to make sure that nobody's forgotten how to stab or get stabbed or shot or whatever -- it's for the actors safety and it's wonderful to watch. Clickenzee to Embiggen! Spoiler: People die. 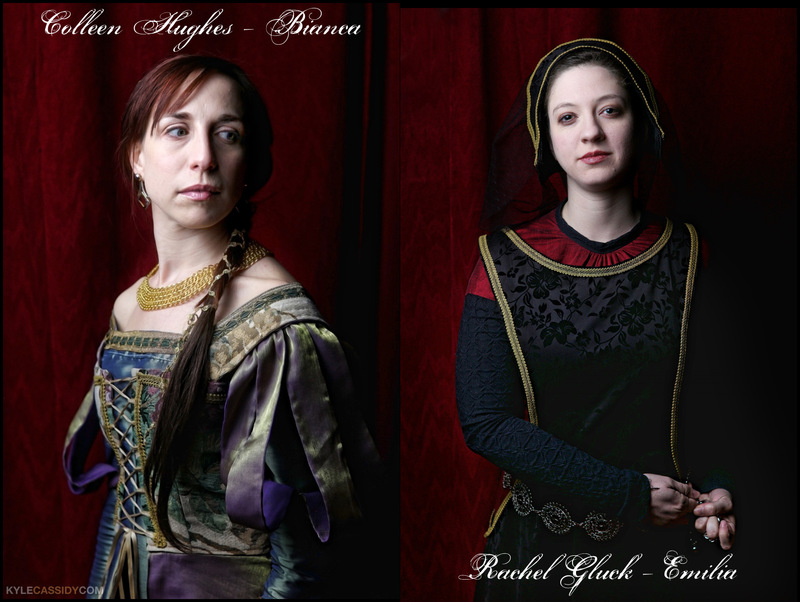 There are lots and lots of different types of theater photography and I think I probably do mine differently than almost everybody else. I'm not very interested in photographing a rehearsal while it's happening. In photography we most tell one sixtieth of a second of truth and I'm hoping to be able to capture the personality of the characters in a single frame -- so that you can look at it and, hopefully, see them as they really are -- that fraction of a second when the front falls away and you work with the actor to find that edge between front and back, between the character on the page and the character off the page and hopefully you hit it and if your actors are good, you really hit it and they can compress the whole of their performance into 1/60th of a second and if you hit the shutter at the right moment, you get it. 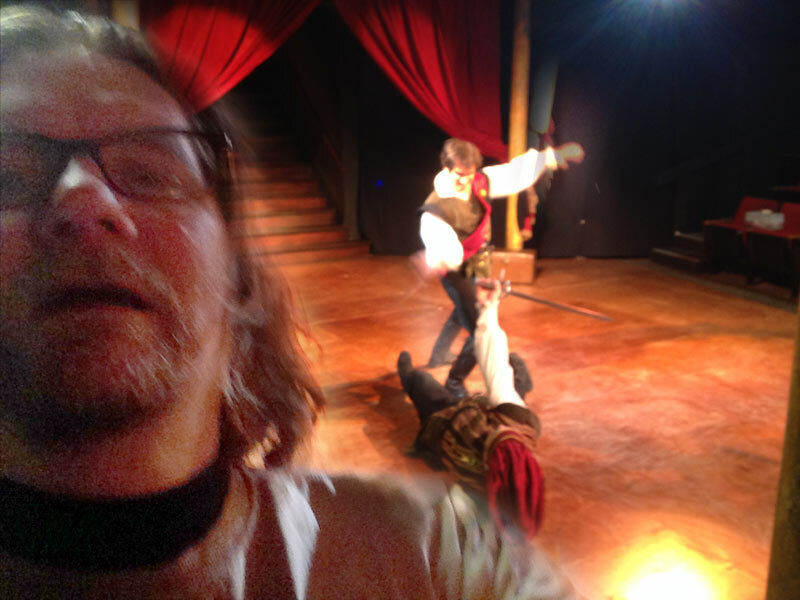 After I'm done photographing there's one fight call left and we haven't done any production photos. I figure I'll just photograph the last fight call since no matter how good your photos are, newspapers always call back to ask if you have a production photo. It's Desdemona and Othello which I'd shied away from photographing before. As Isa and Steve act it out just two feet in front of me I slowly take photos and realize why it's on all the posters for the play. It's such a decisive moment and if your actors are good you forget that you know them and that you're in a theater -- you're surrounded by something transformative and you can't look away. 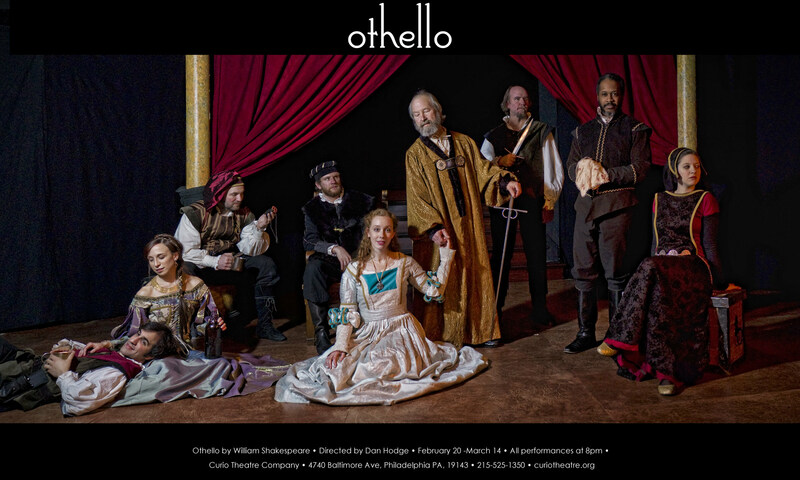 Othello opens tomorrow in West Philadelphia.